I've lost track of how many times a customer has asked me what the difference is between a tummy plate and a vinyl torso. Looking at the pictures on eBay, I can understand why someone not completely immersed in the doll field would be confused by the two. When being posed for photos, the reborns are all "dolled up" so to speak to give them the most realistic appearance possible. In photos, cloth portions are hidden by clothing or a blanket, seams are covered by diapers, etc. It is how a new reborn owner might pose their reborn baby in a cradle at home. After all, the point is to make the reborn baby look real. So how do you know which is which underneath the fabric? Well, I hope this post will help. What is a vinyl torso? A vinyl torso is exactly what it sounds like . . . a torso that is all vinyl. Rather than having the legs attach to a cloth body, they instead attach directly into a lower torso that is all vinyl. Does that mean that the reborn is all vinyl? No, it does not. Full vinyl reborns are actual very rare in the reborn industry. Only a handful of sculpts have been created in a full vinyl version. 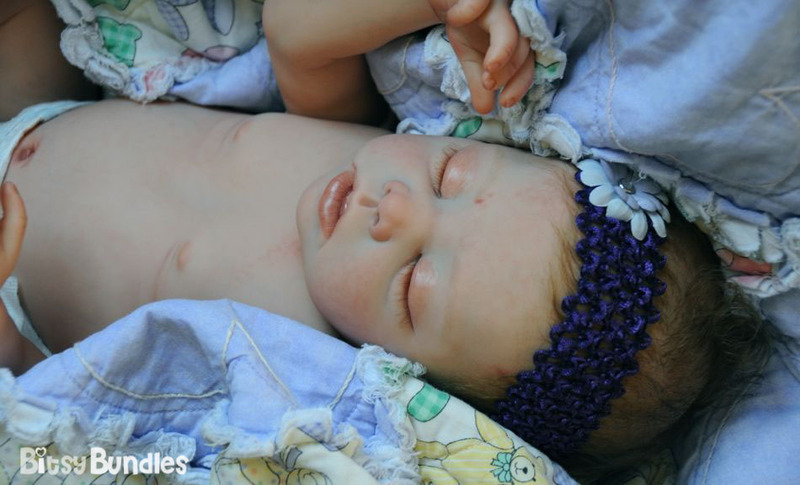 While the look of the naked full vinyl reborn doll is realistic, the feel of it is not. That is where the torso comes in. The vinyl torso is vinyl up to the lower ribcage, at which point it connects to a partial cloth body. That gives the arms and upper body added flexibility (which, in my opinion, is very vital to realistic poses) while leaving the lower body to look more realistic with anatomically correct parts, both front and back. The legs on these torsos are still moveable, if not as much as the arms. They can only be moved forward and backward, not all around like the arms that are attached to cloth can. What is a tummy plate? A tummy plate, unlike a vinyl torso, is removable. It can be added to nearly any reborn to offer an upgrade in realism. A tummy plate attaches only to the front of the reborn doll, and is usually tied on (though I usually attach mine magnetically). 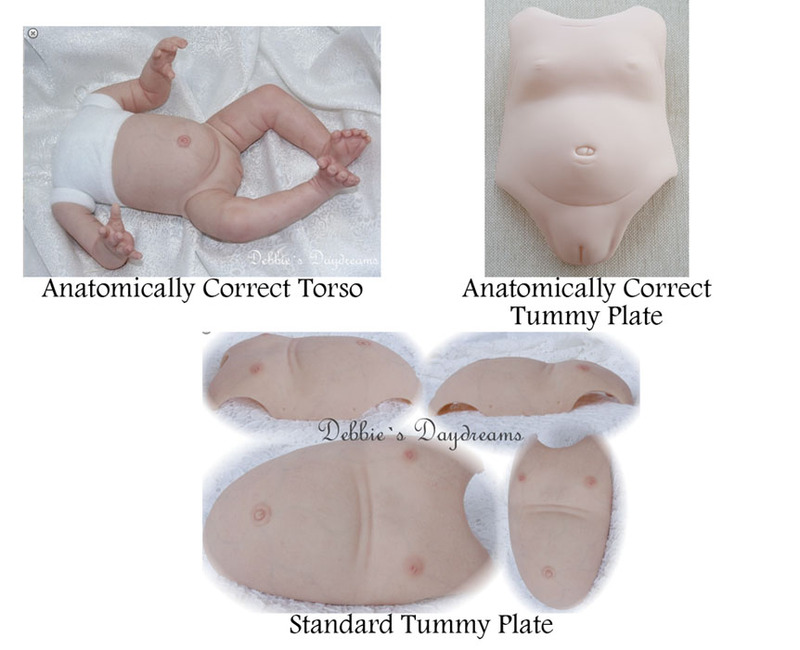 A doll that has a tummy plate has a cloth body beneath it, and the tummy can be added or removed as the owner desires. Tummy plates come both non-sexed and anatomically correct. Occasionally you might see a back plate, which partners with a tummy plate and attaches only to the back, but these are not nearly as common. There are only a few back plate sculpts available, while tummy plate choices are significant. I don't think one is better than another, it is more a matter of preference. While the vinyl torso does have the benefit of tummy and bum with no cloth body showing chest down, it is not as soft and flexible in your arms. Since a tummy plate goes over a cloth body, reborns with tummy plates are a softer, more cuddly choice, however they do have cloth body showing when clothing is completely removed. Some people prefer the added realistic look of a vinyl torso and some people prefer the more realistic feel of a cloth body with a tummy plate that can be added or removed. What I usually suggest to my customers when they are deciding between the two is to think of how they will be using their reborn. Is your reborn going to be a treasured collectible posed in a nursery or on the shelf, or is it to be a doted on baby doll that you will cuddle up in your arms? I usually recommend the torso to those who are wanting to pose their baby on display more than hold their reborn baby. I recommend the tummy plate to those who want the feeling of a real baby in their arms, yet want the realism of a tummy poking out of a shirt.